Camilla Lollia is an Imperial necromancer. 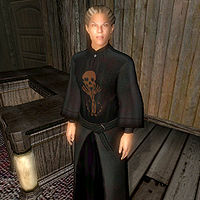 She is one of several necromancers who attack the Bruma Mages Guild during the Mages Guild quest A Plot Revealed. She appears inside the destroyed version of the Mages Guild; prior to this quest, she does not exist. You find her upstairs, in what were once Jeanne Frasoric's quarters. Even if you choose not go upstairs, she will eventually walk around the building until she approaches you. She will immediately greet you, saying with a mix of surprise, sarcasm and anger: "What have we here? A visitor? I'm afraid you've missed the party. The guest of honor has already left. You won't be leaving, though. I'll see to that now." She proceeds to attack you, in part because her aggression has been increased to 40. She wears the standard necromancer's robes along with a pair of pigskin shoes and carries a small amount of gold. She does not carry any weapons, relying instead upon a leveled set of standard necromancer spells for her attacks. If you manage to finish the quest "A Plot Revealed" without ever speaking to Camilla, she will follow you until she talks to you. After the quest is complete, she will not necessarily be hostile. As with other bugged NPCs that follow you (e.g., the Desolate Mine fighters), she may appear outside any city jail after you have been arrested. There are certain occasions where she will walk down to the Mages Guild Basement and approach you. ? This page was last modified on 23 October 2017, at 19:11.